Your complete auto maintenance provider, specializing in prompt, reliable service at competitive prices. Tal's Auto & Truck Repair is a complete auto maintenance facility that repairs and services a diverse range of vehicles -- domestic and foreign -- light, medium, and heavy-duty. Whether you need to schedule a regular maintenance appointment for your vehicle or your fleet, or you require repairs due to damage or malfunction, look no further! Our state-of-the-art service facility marries the latest automotive technology with excellent customer service. Our technicians are ASE-certified. We believe that every customer is special, and we will work hard to keep your business. 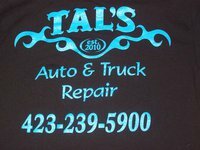 At Tal's Auto & Truck Repair, we're so certain you'll be satisfied that we guarantee efficient, prompt and reliable work, and honest service. Click here to check out our current Special.